Valentine's Buffet At Deccan Pavilion is an event that took place on 14-Feb-2006 in Hyderabad. A monstrous and monstrously delectable menu at Deccan Pavilion to celebrate your ample love - get sotted on the exquisitely, if randomly named dishes. There is Adam & Eve which is really cucumber with yoghurt. There is Laila's choice that is Hummus. And there is Truly, madly, deeply, which is stuffed tomatoes with corn and cheese. If such a crazily toothsome palette is not enough to get you and your partner tipsy in love, there are the poolside arrangements absolutely dripping with romance. 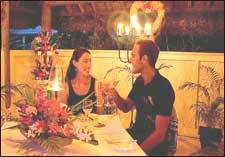 Couple seatings, candle-light and glimmering water. There is the Romanian Band, Grooves Goddesses belting out sheer romance in music while DJ Julian spins his table to turn the heat up just a little more. This is the stuff that probably got Shakespeare in the mood to write Romeo And Juliet. Soak it up. Please contact 2340-0132 for further details. Be the first to comment on Valentine's Buffet At Deccan Pavilion! Just use the simple form below. fullhyd.com has 700,000+ monthly visits. Tell Hyderabad what you feel about Valentine's Buffet At Deccan Pavilion!